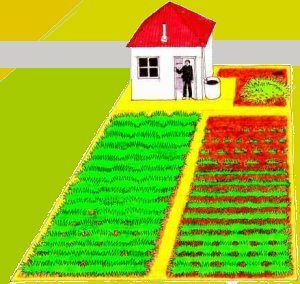 KU SHENG is a farmer who has a litle house on a small plot of land on which he grows all the food he needs to live. He drinks the water collected in a barrel from the roof. Each day he wakes up, and works most of the day watering and weeding and and harvesting and cooking and eating the vegetables and fruits he grows. And in the evening he sits and smokes a pipe, and watches the clouds in the sky, before going to bed. See the days of Ku Sheng.